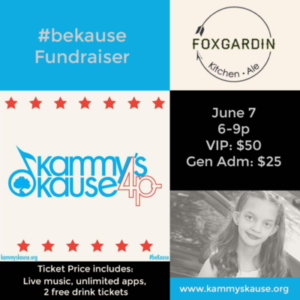 Join us for a pre #kause fundraiser for this year’s event! Learn more about Kammy’s Kause. Have some free drinks and delicious appetizers by our hosts FoxGardin Kitchen & Ale, and listen to some killer live local music. Admission is limited to 100 guests so be sure to register now for an event you don’t want to miss! GENERAL ADMISSION INCLUDES: Doors open at 7pm for live music, free appetizers and 2 free drink tickets. VIP ADMISSION INCLUDES: All of the above for General Admission but for our VIP Guests, doors will open at 6pm with an open bar and free appetizers from 6-7pm!!! Check out the event page for more information!